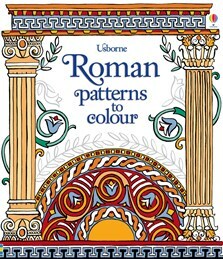 A gorgeous colouring book featuring patterns taken from the buildings, mosaics and jewellery of Ancient Rome. Children can colour mosaic portraits of the Emperor Justinian and Empress Theodora, the masks from a Roman play, a carved fresco of the gods and more. A new and interesting way of learning about the Roman Empire, and the men and women who lived within it - each page includes fascinating information about where each piece of art came from and how it was used. Thick, craft quality pages are perfect for coloured pencils, felt-tip pens or watercolour paints.